Dengue fever has become an imminent threat to international public health because of global warming and climate change. The World Health Organization proclaimed that more than 50% of the world’s population is at risk of dengue virus (DENV) infection. Therefore, developing a clinically approved vaccine and effective therapeutic remedy for treating dengue fever is imperative. Peptide drug development has become a novel pharmaceutical research field. This article reviews various peptidesbased antimicrobial agents targeting three pathways involved in the DENV lifecycle. Specifically, they are peptide vaccines from immunomodulation, peptide drugs that inhibit virus entry, and peptide drugs that interfere with viral replication. 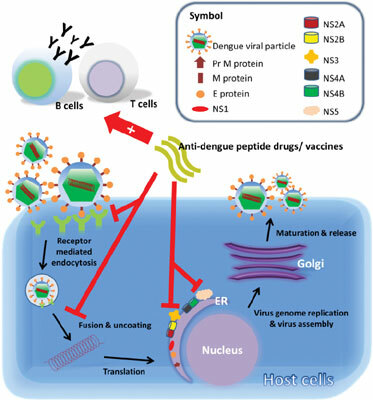 Many antiviral peptide studies against DENV have been conducted in animal model trials, and progression to clinical trials for these promising peptide drugs is anticipated. Dengue fever, dengue virus, peptide drug, peptide vaccine, antimicrobial agents, clinical trials.